My beginning is illustrated at left. 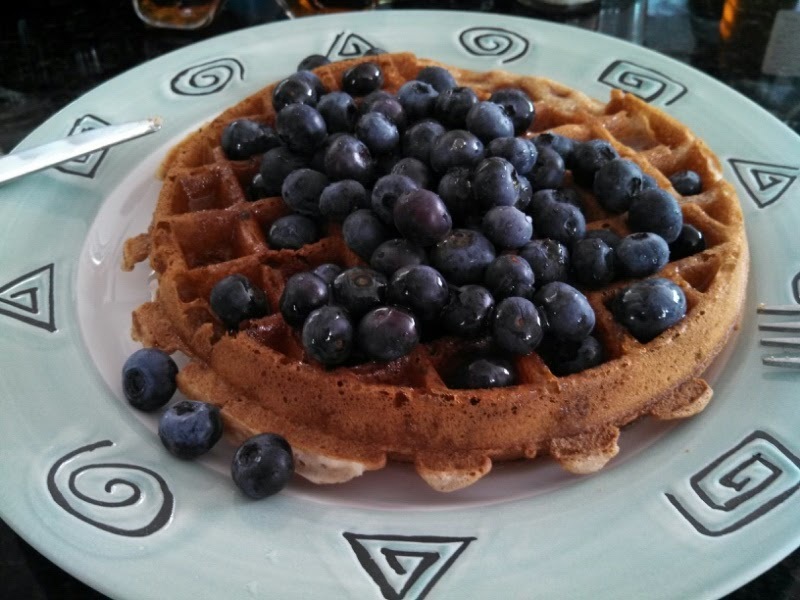 The waffle is mere a delivery mechanism for some exquisite blueberries from my berry patch. The payoff: blueberries with flavor. If you come for breakfast I'd ask if you wanted a waffle, not if you wanted a bear-portion of delight. I would deceive you. I'd then stuff you blue. I put nutmeg and cinnamon in the waffles which compliment the berries nicely. It makes it all irresistible. It's what I do. I'm working the edits now (as you well know) and so the beginning is getting its due excessive and obsessive attention. Oh, sure: lead sentence, hook, rapid transition. All the usual. What I am really crafting is the blueberry business. As in: hey, dead body. [yawn] Clever inspector on scene with the M.E. stand-in witty banter and the F.D. boys packing up the homeland toys they overbought with federal grants. [Hmmm, isn't there a yoga class in fifteen minutes at the gym?] The victim died of blunt force trauma when the backyard chicken coup blew up in an Act of God? [ Pass the syrup, I'm going to try a bite]. I'm going to have to move pretty quick to transition from Act of God to murder. That's my second problem. The point is, an interesting character on the first page with a comfortable setting and comfortable premise and then BAM (sorry Lagasse). The plate appears and it isn't merely waffle. It's loads of blueberries that taste , well - summer morning blue. It's a treat. 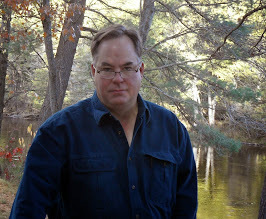 I'm working like a bear to pull this series of edits off because I'd love to show my old friend Andy Deckert that I made it out of the world of June-brown introspective depression to a rolling woodland meadow of color and sound and interest. Bloody landscape can do a lot to your writing. I love a good berry patch. I love a fruit-delivery-mechanism waffle. Stay tuned for crepes. I'm working on the "starts." J: your comments remind me of a Latin phrase that I'm certain you already know. Deus ex machina. But it's usually used at the end of a story when there's no rational resolution to it; so the author resorts to the supernatural. You'd have a devil of a time starting a yarn that way. I see your dilemma. Yours truly, Toe. I look forward to telling the story. That's the spirit! I'm thinking of someone who owns a restaurant that does just breakfast and lunch. You know. Blueberry waffles in the morning and fried chicken at noon. Something off the top of my head. Think of the "Postman Always Rings Twice." Does a natural gas, or propane gas pipeline run under the coops? Was the dead man an inspector, competitor, or what? Did he "deserve" to die? In the sense he brought it on himself. That's enough for now. Yours truly, Toe.